The first time I saw a sweet potato vine was at a plant nursery and gift shop called "My Grandmother's Garden". I was visiting my mother and it was one of her favorite places. The shop owner planted a variety of plants in huge planters and urns. She was skilled at selecting a wide variety of shapes, sizes, and colors, and reds and greens filled the planters. Tall plants of sharp spikes were contrasted with delicate vines and plants with small, bushy leaves. I came away inspired! In analysis, I decided that it was the bright lime-colored sweet potato vines that caught my eye the most! They were gorgeous, classy, and vibrant! If you read Gracious Hospitality, you know that I love tea and everything related to it. 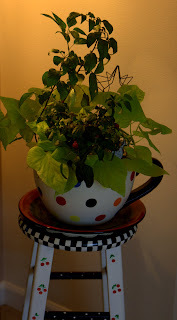 So, last summer I planted a sweet potato vine along with a purple hot pepper plant in this large teacup planter. It did very well in the summer's heat. I was also pleased to find that it wintered over very well in my living room. How I enjoyed its vibrant lime green during the dreary days of winter. Sweet potato vines also grace my outdoor garden. They are tucked into planters and flower garden beds. It grows prolifically and compliments both flowers and plants. It dies back after the first hard frost, but it's a gift that keeps on giving. If you are curious, dig up the root and you'll find a large and healthy sweet potato! Take a look at your garden center if you want to have some fun "creating" gardens with this interesting trailing plant. I think you'll enjoy it, as I have! Today I am linking to Bernideen's Tea Time Blog for "Open House". One summer we visited friends in Worthington, Ohio and I remember the vine grew all up the trees everywhere. I think it does in the south too! I love the picture of the little girl - I remember seeing that a lot in Colonial Williamsburg. I used sweet potato vines in my landscapes before I moved to this house 9 years ago. I think it's time to add some to our outdoor spaces. Thanks for the inspiration! How cool that they did well inside as a houseplant. The summer I had some, they really worked out well. Maybe I'll look for more! I use them in planters outside, but I have never brought it in....have to think about that! They really grow well. Love your planter and sweet potato vines. I love when I see this plant in window boxes, gardens, and pots. I just love sweet potato vine and how did I not realize there was a real sweet potato underneath. I will have to pay closer attention this next fall.